by Mary Ann Hines (au); Gordon Marshall (au); William Woys Weaver (au). Catalog of a joint exhibition held 17 Nov. 1986-25 April 1987 in Philadelphia by The Library Company of Philadelphia & The Historical Society of Pennsylvania. The exhibition drew upon their incredibly rich holdings in culinary history. 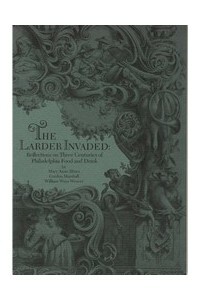 The process of invading their larders & coming out with exciting finds was truly a process of discovery. Much of the material in this exhibition is housed in parts of their collections not susceptible to traditional cataloguing methods: that is, menus, trade cards, advertisements, photographs & ephemera. What was surprising & exciting was that there was so much concerning the culinary history of the city of Philadelphia & its surrounding areas. Illustrations.